Pick you you up at 9 am from your hotel by 4X4 and we start our trip towards Atlas Mountains and we pass through Sidi Rhal village and other villages till Demenate a small old city in the High Atlas Mountains, then we leave the road heading to the amazing place named Imin Ifr a natural bridge classified as a site of biological and ecological interest and considered one of the most visited sites in the area which you visit with a local guide. 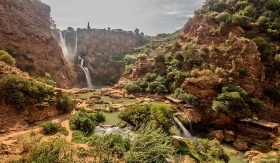 After we continue our trip to Ouzoud waterfalls the big and amazing waterfalls in Morocco, located in the Middle Atlas Mountains. On arrival to waterfalls, we take the small path down to the waterfalls to arrive at lunchtime where we will eat in the waterfall restaurant with a view. After lunch you make a visit of the waterfalls with a local guide for discove the beauty of the cascading falls traversing different paths with contrasting views including the local inhabitants the mountain monkeys.. After you have free time for swimming (summer time), and then we come back to our 4X4, we return to Marrakech and we arrive at 7pm.